...this sort of ended up in the boot of my car. it was only £20 and includes the brushless motor and a 20Amp ESC. It looks fairly scale, ailerons and elevator controls (no rudder). You are wrong, there is always a need for more planes. Besides, if planes are waiting for a new home better give it to them. Hahah I must remember to leave my wallet at home next week at our clubs swap meet. WOW, awesome find!! Let us know how it flies. It has obviously been on the shelf a fair time, some of the ply to foam joins had dried up, nothing a spot of UHU por can't resolve. All it needs to complete is a couple of servos. On the ripmax site a replacement ESC is over £20. I checked out the makers address on Google street view and it's now Ripmax. Hopefully it won't take long to get this plane into crashing/flying condition. It sniffle sniffle brings sniffle sniffle tears to my sniffle sniffle eye`s when I see sniffle sniffle an unwanted plane. Lucky plane it got a very good home someone to brush it off, clean it up and make it do what it is suppose to do FLY.. Most woman develope shoe addictions. You chose planes. Wow @CarolineTyler awesome find. I agree with @PsyBorg I love your addiction . Which does cost more ? @mayan - It was a terrific bargain I think. Wow that looks beautiful . I'm not keen on the prop/spinner combo, very difficult to balance. That racer is making me rethink my method of building 5 airplanes/week and focusing on one really nice one. 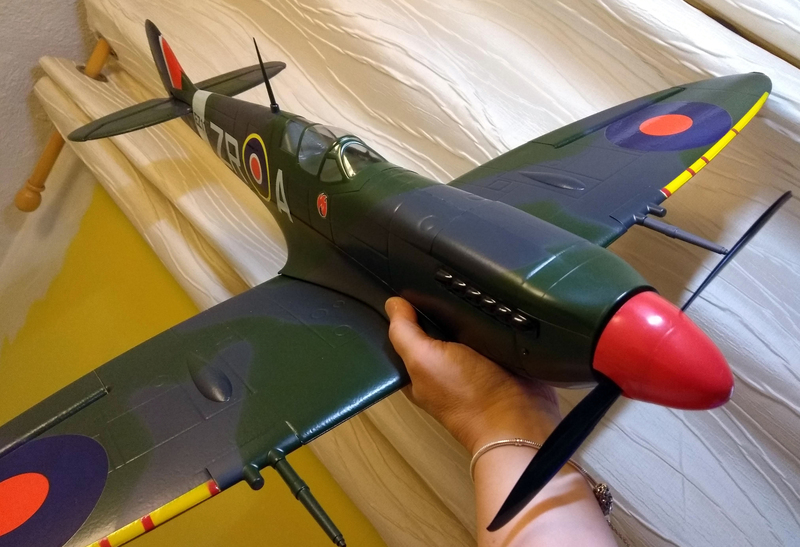 The Spitfire I think will fly fine but it does feel quite fragile so I will try and fly it a scale as possible. Definitely worth a punt at £20! Nice find on the Spitfire, and the FT Racer looks dynamite! Nicely done! Interested in how you ended up in this hobby? I've always loved, no, been obsessed with flying/spaceflight. I remember those first steps on the moon when I was just eight. My late uncle used to fly gliders and light aircraft at Lasham airfield near Reading and occasionally I was allowed to stay with him (along with my elder brother) for a long weekend and go flying. Gliders are amazing to fly in. Once I had my two boys and they were old enough I took up model aeroplane flying, teaching myself and involving them at the same time. Sadly, neither of them were interested and after a couple of years family life took over completely and I stopped flying. Now they are all grown up, I'm divorced, moved to Yorkshire and I have the time again to re-ignite that hobby. 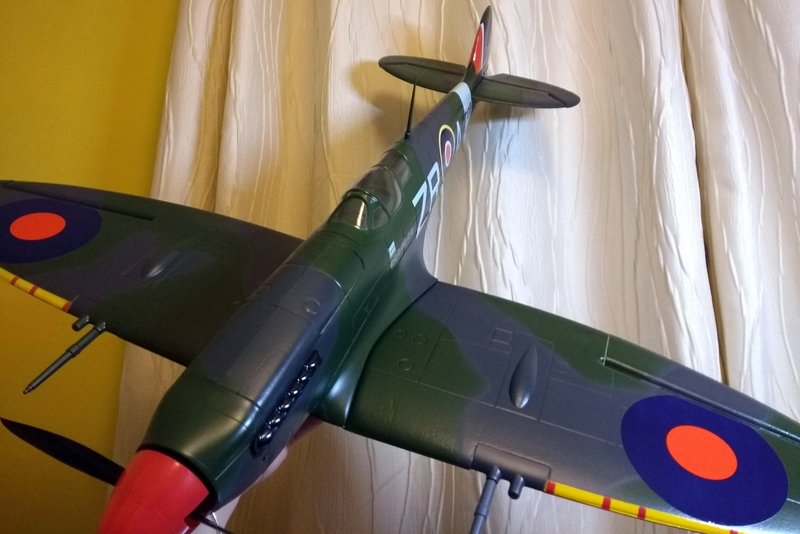 The crappy flying FT-longEZ has been broken up and donated it's receiver for the Spitfire.